B'rith Israel-Anshe Ames Cemetery - Pine Ridge Road, corner of Expressway Exit ( Route 33 ) (Jewish Federation) - Former Russian Cong. Near where Railroad Bridge were located. Less than 1 mile from Union Road. Cheektowaga, NY 14227 Relocated where ? but most were taken to the Lancaster Rural Cemetery. Founded in 1913 with a purchase of 20 acres of land on Harlem Road, Cheektowaga, with an entrance between Genesee and the Kensington Expressway, the cemetery was consecrated by Bishop Henry Colton in 1913. In a letter dated November 28, 1916, Bishop Dennis Dougherty (later Cardinal Dougherty), set down rules for the governance of the Italian cemetery. Additional acreage was purchased for a total 33 acres in a narrow very deep cemetery behind the neighborhood know as Tirearunda. (Cedar Grove section of Cheektowaga, NY) St. Francis of Assisi Chapel Mausoleum was built in 1992. Lovely mosaics of Italian Saints - Santa Francesco and Santa Chiara - St. Francis of Assisi and St. Clare of Assisi - adorn the front exterior. Inside, stained glass beautifully portrays St. Francis, the Stigmata, the Greccio Christmas scene, and the Resurrection. To drive or walk through the cemetery and read all the Italian names gives a feeling for the faith of the Italian ancestors. Presently, Holy Sepulchre, with its 33 acres in the town of Cheektowaga, has approximately 20,000 interments in the cemetery. There are approximately 8 acres of undeveloped land for future cemetery use. Howard Free Cemetery at Pine Hill - Pine Hill Private grounds, devoted to burials from county side outside of Buffalo. 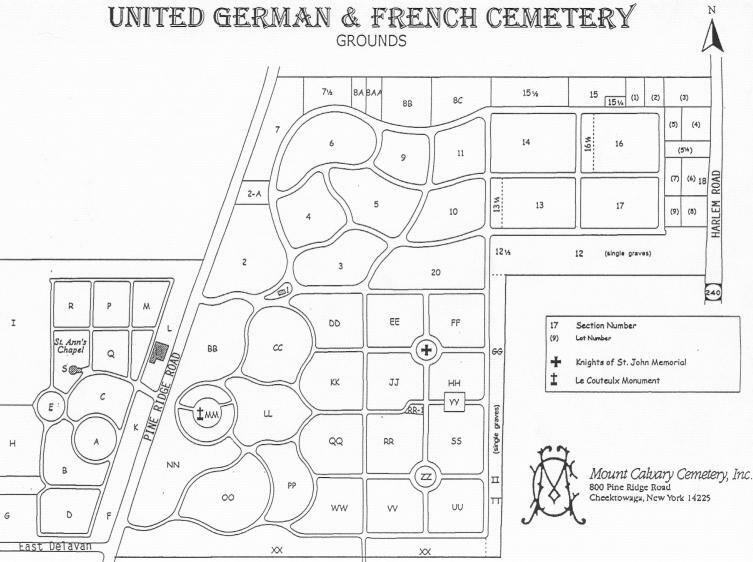 opened Bethal Cemetery, near the United German and French Cemetery. Pine Hill . Temple Society united with them, forming Temple Beth Zion. 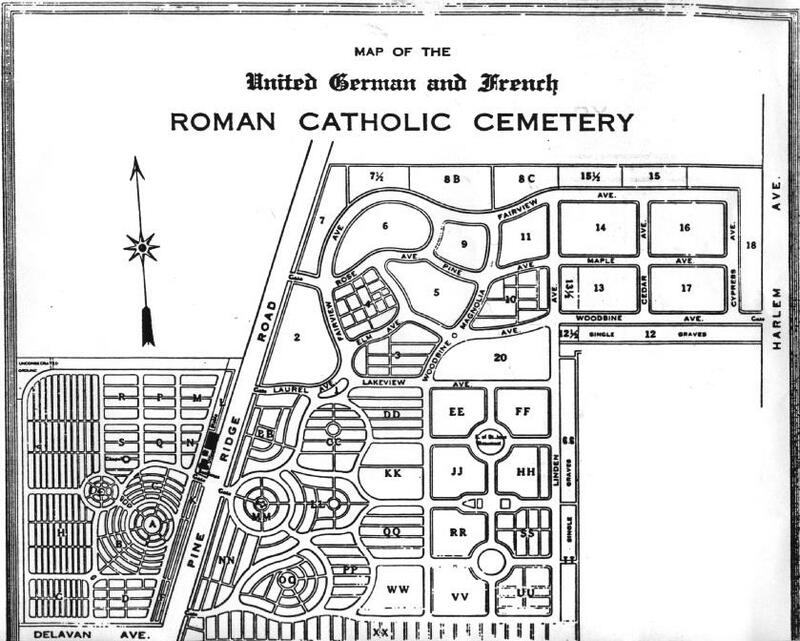 United German and French Roman Catholic Cemetery to the present. The records exit in formats of paper, bound volumes, video, photo slides and maps. Access to some records may be restricted. St. Louis, St. Michael's, the former St. Peter's, St. Mary's, the former St. Boniface, and St. Ann's, all located in Buffalo. There are a total 360 acres of land, with over 250,000 burials. Pine Hill Cemetery or Pine Hill Area (Locally known as Pine Ridge). furthermore they are not staffed for the overwhelming telephone calls requesting a lookup. They will take Genealogy Name Search request in writing. Please include as much information about the person(s) you are looking for. Please include a check for $25.00 for each name requested. 800 800 Pine Ridge Heritage Boulevard, Cheektowaga, New York 14225. Map showing large area of some of Cheektowaga cemeteries. contains A LOT! of cemeteries. Burial cards, Lot cards, Lot Books, Cemetery Registry Books, Section Maps. Mount Calvary; from 1885 for Buffalo Cemetery and 1898 for Ridge Lawn Cemetery. have marker's are not listed. Area located at the Buffalo and Cheektowaga border, containing A LOT! of cemeteries. 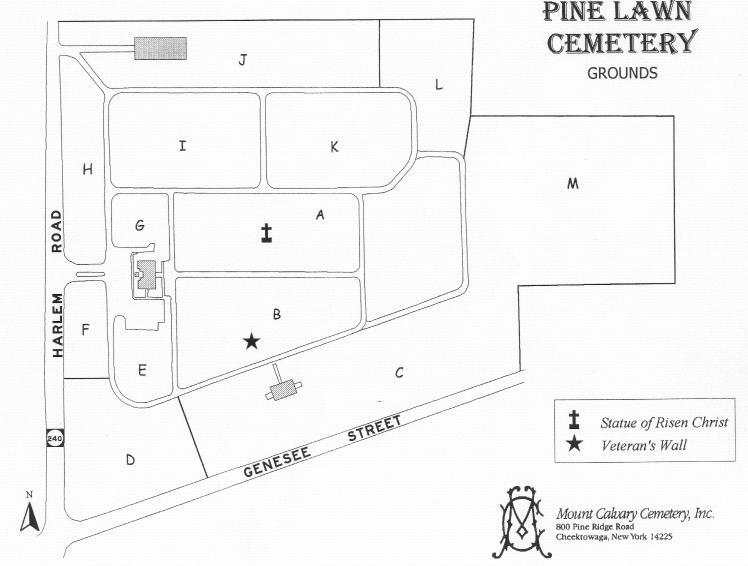 Pine Hill is listed as the burial place on older death certificates. Pine Ridge Area Area located at the Buffalo and Cheektowaga border, containing A LOT! of cemeteries. Of Zion Church also used Zion Church Burial Ground. Saint Adalbert Cemetery (Old) ~ 1890 to 1903.
has indexed the St Adelberts Old Cemetery. 212 Stanislaus St. Buffalo, NY 14212. There are numerous misspellings contained in the original book. The person writing the names sometimes wrote the Polish names as he thought they sounded. Then he used the Latin versions for first names. When searching for an ancestor, try looking for misspelled names. which is arranged chronologically in order of burial dates. The index only covers the first ninety-three pages covering the years 1890 to 1903. Reason for this was these pages contained the location of graves. Listed were the section, line and grave numbers. Sometimes there can be conflicting locations for grave locations. There are cases of two or more names for the same grave. I have tried to be as accurate as possible, but some errors can be found in original book. to settle any discrepancies for spellings, dates, or locations. This index only pertains to the Old Cemetery on Dale Road in Cheektowaga, NY. Saint Adelbert R.C.Cemetery (Old) ~ Leo J. Kopp ~ Tombstone readings. Office hours :Monday - Friday 9 am - 4 pm, Saturday 9 am - 12 pm. youth, it is. Besides, it's the only St. John's listed in the directory. The phone number for the church is (716)632-6557. The ladys name is Phyllis and she can be very helpful if she is in a good mood. Most of the people buried there went to St John's Lutheran Church now on Main St in Williamsville NY (suburb of Buffalo). St. Mary's Cemetery Cemetery ~ Behind the Thrway Plaza, corner of Walden Ave and Harlem Road. Records Information: Records are stored on-site, no appointment necessary. Staff is available for assistance. Soldiers Plot - Pine Ridge Rd. Union Road Cemetery ~ Union Road & Genesee Street, A lost cemetery that was located across from the Airport Plaza. Remains were reinterred to the Transit Rural Cemetery in the Town of Lancaster. United German and French Roman Catholic Cemetery 1858 - 1921? United German & French Cemetery ~ Bob Ziegler (Pine Hill ) (B) 1875 - 1904 ? Kentucky. (Names listed) Also, British soldiers. Information from "A History of the Town Of Amherst, New York"
by Sue Miller Young 1965. Zion Church Cemetery - Pine Ridge 1859 Belongs to German Evangelical Reform Zion Church. Four acres. of the Hawthorn trees abundantly growing in the area. Cheektowaga is located in Erie County a SE suburb of Buffalo off I90 near Buffalo International Airport. It is in the Western Region of the state. Cheektowaga is part of the Buffalo-Niagara Falls, New York metro area. 3301 Broadway & Union Rd. Newsletter - Cheektowaga Archival News. Local history, 19th and 20th century after 1850's, records unavailable. No records at this location. 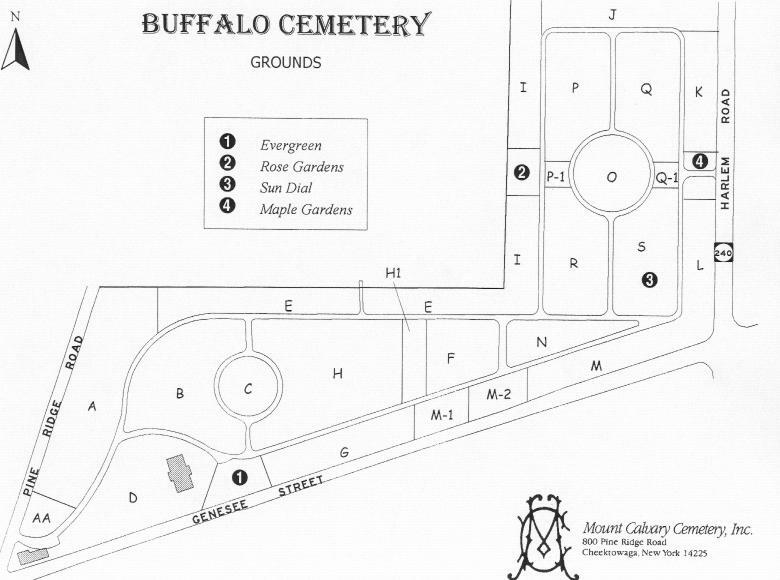 Map showing the large area of cemeteries in Cheektowaga.. Still searching..............after all these years. Copyright ©1997 KMK All rights reserved.